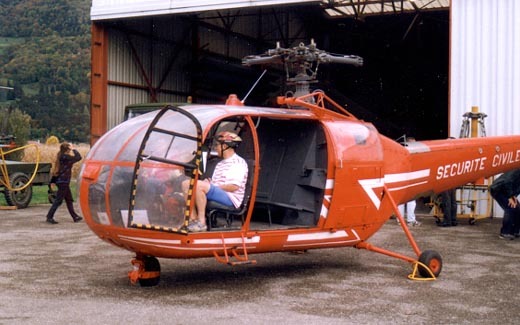 The Alouette III was developed by Sud Aviation to replace the Alouette II It takes again the principal dynamic components in a vaster and careened cell increasing its field of application. First version (SE-3160) accomplished its first flight on February 28,1959, piloted by Jean BOULET and Robert MALUS. Version SA-319 appeared in 1970 with a more modern and less greedy turbine. Its production in France was stopped in 1975 after 1455 built specimens. The Alouette III is a very general-purpose machine. Used by many armies in combat or in research and rescue configuration, it was one of the first machines to being in standard equipped with an armament. 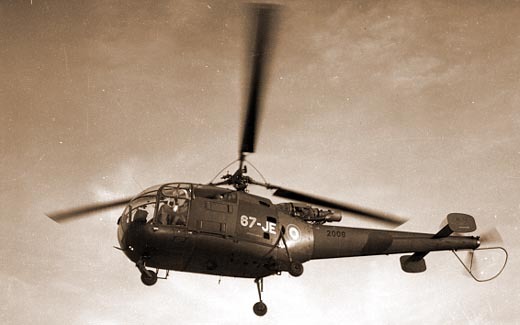 Very present also in the civil world, the Alouette III is used at sea and on ground for a great number of missions in all kinds from VIP transport to road surveillance. 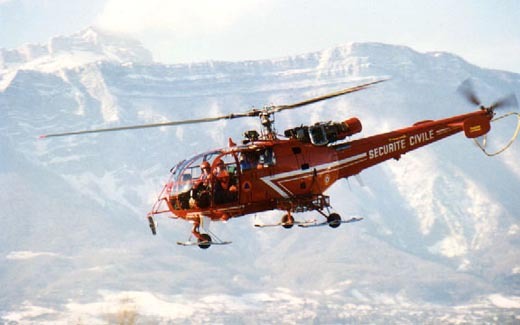 It remains however the best helicopter for mountain-rescue : all the French mountain people know red Alouette III of the Sécurité Civile. The SA-316 s/n 2084, crashed on April,16th 1984 at Chambéry (France), arrived at CELAG on 1990. 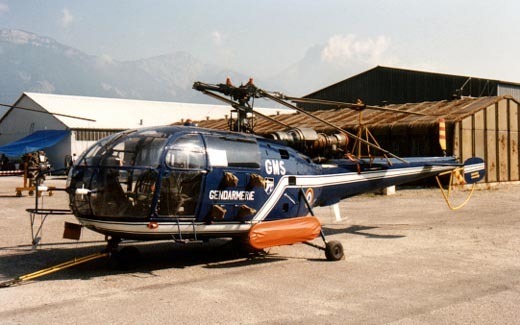 This Alouette is being restored in the French Rescue version Sécurité Civile, for the youngest. The SA-319B s/n 2112, crashed in the Pacific ocean, arrived at the beginning of 1992. Restored from 1992 to 1993, it displays the markings of the French Military Police (Gendarmerie Nationale). The SA-319B s/n 1968, crashed at Tontouta (Pacific) on April, 26th 1989, arrived with the 2112. It was used as spare parts source for the restoration of the two others. 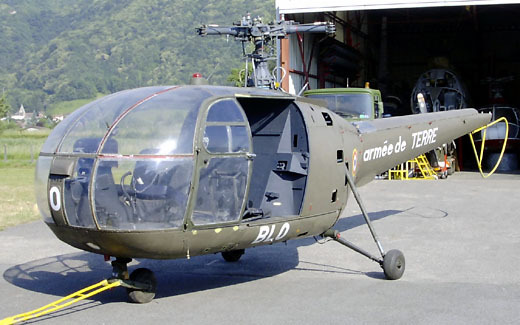 La SA-316 N°1412 aux couleurs de l'Aviation Légère de l'Armée de Terre qui serait, selon toute vraisemblance, la machine 01 de pré-série, est arrivée en décembre 2001. Livrée le 17/03/1961 au GE.ALAT (Groupement d'Expérimentation de l'ALAT) implanté sur le terrain de Satory. Elle a servi à de nombreuses expérimentations, notamment en Algérie au sein du GH2 de Sétif-Aïn-Arnat, avant d'être accidentée le 27 novembre 1962. Reconstruite, elle aurait servi par la suite à l'instruction. The SA-316 has been declined in versions A, B and C all equipped with a Artouste III turbine. The version B is characterized by reinforced transmissions and C, which come out in 1972, by the adoption of a more powerful version IIID of Artouste turbine. The SA-319, also declined in version A, B and C, is equipped with a Astazou XIV turbine. The adoption of this turboshaft made possible to increase the possibilities of this machine in spite of a higher weight., by the more low fuel consumption of the engine.